Editor’s Note: Part 1 of this series introduced the subject of toe kicks and provided the basics of how they are performed. Part 2 discussed the author’s own introduction to toe kicks as well as some of the early great Shorin ryu masters who used this technique, their targets and some of the strategy of applications. Part 3 continues the discussion of the toe kick through the Matsumura Seito branch of Shorin-Ryu and introduces the Naha-te lineage and their use of toe kicks. Part 4 will continue the discussion of Naha-te. Future articles will discuss other Shorin-ryu masters who utilized the toe kick first on Okinawa and then in Japan. Future articles will also discuss targets, possible implications for DIM MAK as well as the conditioning and development of the toes. Among various other dojos I visited in Okinawa in 1984 was that of Fusei Kise. Kise was a long time and senior student of Hohan Soken sensei and was recognized in 2002 by the Japanese government as inheritor of Hohan Soken’s system (Soken was discussed in Part 2). Fusei was a long time friend of Roy Suenaka (my aikido teacher who is also a teacher of Matsumura Seito Shorin Ryu karate), who I accompanied in this visit. In his classes, Kise stressed mobility, says James Coffman, who studied with him on Okinawa. High stances are used to maximize this mobility. High stances also allow a leg to be easily lifted to either block or kick. Kise liked to move and toe kick simultaneously. His counter techniques and blocks were often harder than Soken’s, however, and often punishing. He would often use a hard block to punish an attacking arm and slightly turn the opponent (sometimes setting up kicks to the back). One of the old sayings was “Break off the arm and beat him with it.” (2) In comparison, Soken’s techniques seem much softer. 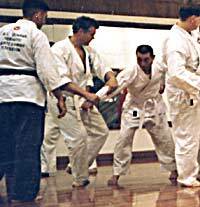 A rare 1962 photo (left) of James Coffman blocking a punch- toe kick combination by Fusei Kise when both were students of Hohan Soken Sensei. Notice Coffman’s downward strike to the long bones on the top of Kise’s kicking foot. At right Kise blocks Coffman’s right punch while simultaneously countering with a right backhand strike to Coffman’s face, under which a low toe kick is launched. (Courtesy of James Coffman). Toe kick targets that Fusei Kise stressed included: a point to the inside of the leg just below the knee, a point on the inside of the leg above the knee, a point below the ankle bone, a kick to the top of the foot (toe pressure or stabbing kick), and from the rear, a kick to the buttocks. He used toe kicks to the outside of the leg as well. 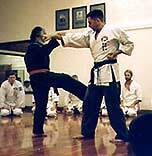 Sensei Fusei Kise steps off the attack line at a 45 degree angle, intercepts a punch and prepares to execute a toe kick to the lower leg of the attacker (photo left). Once off line Kise counters with a toe kick to the inside of the attacker’s rear leg. (Dec. 1994 –Gunners Gym, Camp Foster, Okinawa). The advantage of this 45 degree movement is the ability to maintain distance by retreating at an angle as an attacker advances. This allows the defender to counter or trap an attacking arm, for example, but be off line so a second attack is not possible. It also sets up the position for a counter kick, such as a toe kick to the front or rear leg. Kise’s techniques are based more on power than Soken’s, says Coffman. This power was used to redirect the attack physically. It is also more linear, and more kumite orientated, whereas Soken used less force and were performed to closer tolerances (finer movements). 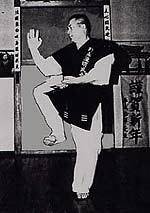 Kise also used to teach basic exercises that used ten basic toe kick combinations as counters to any kick. In these exercises an opponent’s kick would be blocked in such a way as to sweep it to the side and turn the opponent to expose targets on his rear, such as the calf, behind the knee, buttocks, etc. If the attack was a front kick, one counter included a straight toe kick into the crease where the torso meets the leg (where the femoral artery and nerve that are exposed between the muscles – more exposed on the right than left side) – one of Kise’s favorite targets. Kise also liked to use his toes on targets on the outside of the leg. These targets require considerable more toe strength because the thigh is covered with a thick muscle mass. If you are just beginning to practice toe kicks and your toes are not well conditioned, only softer targets should be targeted. In the front these targets include the inner thigh, lower abdomen, and groin. To an opponent’s rear these would include behind the groin, into the buttocks and up into the back of the knee. The Japanese character for rice starts with two cross brush strokes (like a plus sign - “+”), with additional brush strokes added at 45 degree angles – the eight angles often used within martial arts to indicate possible directions of attack, defense or off-balance. While most styles of karate usually include movement patterns in eight directions from a single point (often referred to as the “rice line” because it resembles the Japanese character for rice), important differences can be noted in the manner in which lines of movement are stressed within a style and how they are combined with toe kicks. Soken, for example, was noted for his forward movement at an angle while countering (often including use of the toe kick), while Kise preferred to move at an angle backward (although he moved at other angles as well). In Part 2, we noted another Shorin-ryu stylist, Kyan, who when using a toe kick (or other defensive counter) preferred to move forward at an angle or directly to the side. Other styles, such as the Chinese art I had studied (mentioned in Part 2), are more direct, minimizing defensive movements to the side or rear, preferring often just to overwhelm an attack with speed combined with a flurry of multiple movements. There is also a difference between the use of toe kicks in free fighting and self-defense. In free fighting when movement is fluid, and both sides are in constant adjustment and doing flurries of technique, pin-point targeting is impossible. Here toe kicks should be directed at the larger, most accessible areas – such as the lower abdomen and floating ribs. This is illustrated by the story about Tadashi Nakamura that started Part 2. Suenaka demonstrates on this author a trapping technique typically taught by his karate teacher, Hohan Soken. When an opponent’s wrist, arm, shoulder, or leg is captured, the opponent’s body movement is stabilized. This allows precise targeting by toe kicks and other follow up techniques. This type of capturing, also called “karamiti,” meaning trapping and entangling, is found in (although hidden in) many Shorin-ryu kata, such as the Pinans. If you are a Seido Juku karate student you will recognize the similarity of the above catching technique to the beginning of Intermediate Self-Defense # 1. Self defense situations offer more opportunity for toe kicks. The strategy is to stop, redirect and often capture the initial technique. Often too the initial technique is a grab or a push which tends to freeze the attacker’s position. Soken, for example, often employed simultaneous control and capturing of an attacking arm along with a counter – thus limiting the opponent’s movement and making him vulnerable to more targeted counters. Here we will depart from the Shorin-ryu tradition to discuss Naha-te, and its reemergence under several great teachers. Additional Shorin-ryu teachers will be discussed in Part 4 of this series. The Naha-te tradition might have been virtually unknown if it had not been for two men: Kanryo Higaonna (1853-1917) and Kanbun Uechi (1877-1948). Both traveled to China to study and each brought back to Okinawa similar systems of technique and kata from the Chinese Fujian province. When they returned from China, since martial arts no longer had to be hidden, these teachers could now openly teach and accept students. Kanryo Higaonna (often written Higashionna) was most responsible for re-sparking the flame of Fujian fighting traditions that would grow into a major tradition. But it was not Higaonna himself who developed a great following. Instead it was his student, Chojun Miyagi, who translated Higaonna’s art into a popular style now known world-wide: Goju-ryu (although the name Goju Ryu did not actually exist until the late 1920’s or early 1930s when the first styles were named). Born in Naha, Higaonna’s family was impoverished despite the fact that they were shizoku (social ranked aristocracy) (9), his father being a 9th generation successor to the King. It seems, however, that they still had social and political connections. As a youngster, it is said that Higaonna learned Okinawan ti (indigenous fighting techniques) (10) and later tode (an early name for karate) (11) from Peichin Seisho Arakaki from Kume village, who was one of the king’s bushi (and whose father was Shuri’s chief magistrate in the area). With the help of an Okinawan diplomat with contacts in China, Higaonna traveled to China to study in 1873. There is a story about Ryu Ryu Ko. Just as a farewell party on a junk for one of his students was ending, the student decided to test the skill of his teacher, Ryu Ryu Ko. Higaonna returned to Okinawa in 1893 when he was 40. He became one of the leading martial artists of his time. Higaonna, while small, was fast moving and had powerful hips. His nick name became “Ashi no Higaonna” (Legs Higaonna) for his kicking ability. Higaonna had two students, each of whom ultimately founded his own his own style. Chojun Miyagi, noted above, founded Goju ryu karate, the best known Naha-te style, and Juhatsu Kyoda founded To’on ryu, which remained a closed family tradition until 1971 (To’on ryu will be discussed in Part 4). Chojun Miyagi (1888-1953), the son of a wealthy shipping family, began his training at the age of 11 with Ryuoku Aragaki, who introduced him to Higaonna. He trained arduously for 14 years with Higaonna – first in Sanchin, the central kata in Naha-te and basics, and later more advanced technique. Through Higaonna, Miyagi was introduced to other teachers as well. (15) Upon his master’s death in 1915, he followed his footsteps and traveled to China to find his teacher’s teacher (but he had passed away). Richard Kim (the famous author, Shorin-ryu teacher and historian) told this author that Miyagi also traveled to Shanghai in 1936 where he studied Pa Qua (16). A young Chojun Miyagi (circ. 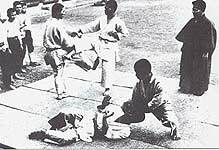 1905) at left blocks a toe kick-punch combination by Juhatsu Kyoda (founder of To’on ryu. See Part 4), while simultaneously countering with a toe kick to Kyoda’s groin (left). At right Miyagi, now more than 30 years later, supervises two of his own students performing the same combination. To Miyagi, kicking and punching to expected targets was not karate. One of his senior students Meitoku Yagi (who went on to form the Meibukan Goju ryu organization) tells this story. One day a visitor to Miyagi’s dojo was showing off, asking students to punch him in the stomach to show how strong he was. Miyagi watched and after a while went over to this student. The student tightened his stomach waiting for Miyagi to test him, but Miyagi instead kicked him in the groin. Miyagi then commented that karate is not just to punch and kick to where people are strong, but to punch and kick where they are not expecting it and where they are weak. (19) The toe kick certainly matches this bill, especially when it targets the leg and lower abdomen. So do many other techniques of early karate that targeted areas now out of bounds in competition karate. Miyagi had several other well known students including Ei'ichi Miyazato (Jundokan), Seiki Higa, Toguchi Seikichi (Shorei-kan) and Gogen Yamaguchi (Japanese Goju-ryu) who are considered inheritors of his karate. Each too founded his own Goju Ryu organizations. These teachers too, although in limited fashion, carried on the toe kick traditions inherited from Ryu Ryu Ko through Higaonna to Miyagi. In Naha, Okinawa I briefly trained with Ei’ichi Miyazato at the Jundokan, but never saw a toe kick used. According to Glenn Cunningham (Jundokan for NYC), however, he asked Masaji Taira (a leading teacher in the Naha Jundokan headquarters known for his innovative kata applications) about the use of the toe kick and was told that it was still used occasionally and taught primarily to kick up under the groin after capturing an opponent’s kicking leg, (20) similar to what the Miyagi photos (above) show. Another early student of Miyagi, Meitoku Yagi and his sons, however, do continue to teach the toe kick, but on a limited basis. I did not see it practiced, for example, when I visited several Meibukan dojos on Okinawa. In 1998 I was invited to attend a seminar of Meitetsu, his son (who with his brother now have inherited their father’s system). He is outwardly very gentle, and quite open to discussion and questions. We practiced self-defense, kata applications and kata, but again the toe kick was never seen. 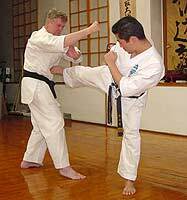 Meitoku Yagi often demonstrates another use for the toes, but not actually used as a kick. It is an application from the first moves of Seisan kata. In the beginning of the kata there is a slide forward done three times, where (in the application) you actually step on the center of your opponent’s foot, combined with a press forward with the hands done at the center of the chest. Meitetsu Yagi demonstrates lifting the leg with his foot ready to kick. The move is similar to the first part of the block and counter toe kick combination described below. Thus certainly the toe kick is practiced within the Meibukan tradition of Goju ryu karate, but how central is it? To help clear up this question I asked Sean Wong, who teaches Meibukan Goju Ryu karate in Markan, Ontario (just north of Toronto, Canada), to ask Meitetsu about it. Meitetsu replied that his father when younger did more toe kicks, but less as he grew older. Meitetsu said that Shorin-ryu karate uses the technique more than Goju-ryu and that while in Meibukan they on occasion use it, it is not considered central. Instead the blade of the foot and heal are more Goju ryu. This is confirmed by the fact that Goju ryu kata do not contain toe kicks. Acknowledgments: FightingArts.com would like to thank James Coffman for the photos of himself and Fusei Kise which he provided, and Master’s Publications for the two illustrations of moves from Seisan kata from their book “Goju Ryu Karate Do Kyohan” by Gogen “The Cat” Yamaguchi. Author’s Note To Readers: This article series represents the author’s personal experience. While I have added historical references and information, it does not claim to give a full representation of any specific art or karate style’s strategy or technique. Likewise, some styles and masters have undoubtedly been overlooked. More coverage is given to styles and teachers about which there is personal knowledge. The goal is not to provide a full historical accounting of toe kicks, but to provide accounts, information and anecdotes that together will give the reader a fuller appreciation of the place of toe kicks within the historical context of karate. Disclaimer: This article is for educational purposes only. The intent of this article is to provide information on the historical roots of the technique and practices related to the development and methods of early karate and related arts. It is not the intent for the content of this article, or techniques demonstrated or discussed herein to be practiced or adopted within the curriculum of present day martial arts practice. The techniques described and illustrated may seriously harm an opponent or training partner and readers are not encouraged to use or practice them. 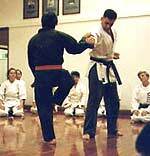 If the reader wants to perform any martial art technique he or she is advised to do so only with proper supervision and training of a qualified instructor or teacher certified within the art to be practiced. (1) Mitsusuke Harada Sensei, who was an early student of Gichen Funakoshi and who trained with Yoshitaka (known as Gigo) Funakoshi (Gichen’s son), notes in the book “Karate Master –The Life and Times of Mitsusuku Harada” by Dr. Clive Layton (p. 21) that Yoshitaki was instrumental in developing the roundhouse technique for karate, which he practiced using the toes as a striking surface. (3) Personal notes of the author taken after visiting a number of Fusei’s classes in his Honbu dojo and from Gunners Gym at Camp Foster on Okinawa, Dec. 1994. (4) See footnote # 2. (5) Kise’s emphasis or preferences might reflect his training with Shigeru Nakamura. Kise received his early training and black belt in Seibukan Shorin-ryu (also known as Shorinji-ryu). In 1958 he started with Soken but in 1960 also started training with Shigeru Nakamura, founder of the Okinawa Kempo Karate-do Association, where he received most of his rank (up to 7th dan). Nakamura’s karate was a harder style than Soken’s. It also pioneered early freefighting with protective (kendo adopted) equipment. Thus it emphasized more freefighting than Soken’s self-defense oriented karate. It was only after Nakamura’s death that Kise joined Soken again full time. He became a senior student (9th dan in 1972) and helped Soken organize his curriculum of “Machimura Suidi”( Matsumura Shuri-te) into what became Matsumura Seito (orthodox) Shorin-ryu karate. (6) Many styles of modern karate can not be identified as pure Naha-te or Shuri-te (Shorin ryu), and thus these terms have given way to karate traditions associated with individual teachers or identified by style names. Many of these were adopted after WWII when karate was taught by various teachers on Okinawa for commercial purposes. (7) On Okinawa, as opposed to China, there exists virtually no written history of martial arts practice since for centuries it was practiced in secret, behind closed doors – within family, court and village traditions. What remains is only a patchwork of spotty oral tradition which is both incomplete and conflicting. What is known about karate’s development and history on Okinawan is very limited. Beyond a few names there is little information before 1800. Also evidence suggests that martial arts on Okinawa (prior to 1880, but also with development of tode in the late 19th and early 20th centuries) were the province of the upper classes (nobility) and learned for self defense, law enforcement, guarding the King and noble class, as well as for protection of trade and commerce (of Okinawan sea trading vessels), rather than among the general peasant population. (8) “Unanate-The Secrets of Karate: 2nd Edition” by John Sells, p. 37. According to the history of Ryuei-ryu, Ryu Ryu Ko might have been an official martial arts teacher to Chinese Military Attaches. This difference in Ryu Ryu Ko’s position from Higaonna’s teacher might suggest while the name is the same, the teachers were actually different individuals. Another early Okinawan karate pioneer, Sakiyama also traveled to Fujian and brought back a similar tradition, but he had few students. He returned around 1845. (10) Te (or ti in Okinawan dialect) means hand, and refers to indigenous fighting methods of Okinawa. These methods are still practiced today to a limited extent within some systems and also are considered to have affected the techniques and applications of what became karate. Mark Bishop in his book, “Okinawan Karate-Teachers, Styles and Secret Techniques” (p.11) states that ti was historically the martial art of the King, princes and anji who lived in the capital city of Shuri. He further represents that while some te techniques have been absorbed within karate, it is also sometimes taught side by side with karate and kobudo as a separate art (p.12). It must be remembered, however, that Bishop himself is a teacher and exponent of Motobu Ryu (a ti system using open hands and the thumb for striking as well as many weapons and that uses grappling and throwing techniques). Thus his viewpoints are possible colored by efforts to promote his own style. Bishop quotes Shoshin Nagamine as saying that Higaonna learned ti in his youth and later tode from Siesho Arakaki from Kume village. It is within Shorin-ryu, however, that ti (or te) seems to have had greater influence. Matsumura is said to have studied it (Bishop p. 53). Hohan Soken’s thumb techniques (noted in the footnotes of Part 2), may have originated from ti. Bishop also notes that Choki Motobu also sometimes practiced a unique version of Tekki kata (p.99) consisting of ti-like throws using pressure on vital points. (11) Tode (also tuti, todi, or toudi), is an Okinawan word often used to refer to techniques we now know as karate, but which literally means Chinese Hand, “to” being the pronunciation for a character meaning T’ang (referring to the T’ang dynasty in China), a term often used to mean Chinese. (12) Ryu Ryu Ko is a mysterious figure in karate history since no record can be found of him in Fuzhou, China, according to John Sells in his book “Unante – The Secrets of Karate, 2nd Edition”, p.43. Higaonna may have in fact traveled to China more than once since one reference suggests he accompanied Kanagushiku (also known as Itoman Bunkichi) there in 1891. Roy Suenaka (my aikido teacher and also a long time student of Hohan Soken) is married to a woman whose family were neighbors of the Kanagushiku family, who also still reside in Itomen. According to this family, Kanagushiku never took on a student stating that he had never found anyone sincere enough to teach, except his granddaughter, and she was not taught either because she was a woman. (13) “The History of Karate- Okinawan Goju Ryu” by Morio Higaonna (who while a Goju ryu teacher is no relation to Kanryo Higaonna), p.17. While a toe kick was not specifically mentioned, it is the only kick that could produce such internal damage and is consistent of other incidents with similar results. (14) “The History of Karate- Okinawan Goju Ryu” by Morio Higaonna, p.28. While the text does not specifically mention use of the toes, Higaonna was known for this kick. (16) Morio Higaonna does not speak of Miyagi studying any martial arts when he visited China. He does note, however, that when Higaonna died Miyagi was without a teacher. In 1915 Miyagi returned to China to research Ryu Ryu Ko (staying for two months in Fuzhou). He met with one of Ryu Ryu Ko’s students (p.53) who took Miyagi to the mountain temple where Ryu Ryu Ko had studied as a young man (near Fuzhou) which was in ruins (p. 55). Ryu Ryu Ko may have been a court official for the ruler of Fujian. Miyagi was told that during the war (Boxer Rebellion or Rebellion of 1911) many fled to other parts of Asia or went underground. Between 1920-1930 Miyagi made a second trip to China (one month stay) accompanied by Go Ken Ki, the famous White Crane practitioner (acting as interpreter). Foreigners were mistrusted at the time (in Sept 1931 Japan began its war in Manchuria), especially those coming from Japan (p.56). Miyagi was constantly studying and researching his karate, his kata and technique and taking notes, which Morio Higaonna suggests led Miyagi to develop the Tensho kata. Trying to preserve karate and promote it in 1926 he formed the Karate Kenkyu Club where Shihans Miyagi, Chome Hanashiro, Choyu Motobu (elder brother of Choki) and Kenwa Mabuni taught individually and to groups. Sells in his book (see above) notes, however, that Miyagai returned again to China in 1936 to Shanghai where he supposedly studied Pa Qua (pp.82 & 104 a fact also confirmed with this author’s conversation with Richard Kim). Kim (see footnote 16) served in Shangai in intelligence (for the Japanese forces) and oversaw both the curriculum of the Shangai Martial Arts Academy and several of its teachers. Kim says that the Academy’s records indicated that Miyagi briefly studied Pa qua, which Kim believed was the inspiration of Miyagi’s Tensho kata. But this is improbable since Tensho was created in the 1920s. Instead, Miyagi’s Pa Qua experience might have contributed to his development of the later developed Gekisai kata (created with Nagamine shortly before WW II according to Sells, p.228). Other sources suggest that the name of the place that Miyagi studied was Seibu Dai Iku Kai (Great Gymnastic Association, Pure Martial Arts Spirit). (18) Kim recalled this demonstration to have occurred around 1924, but other sources trace Kano’s visit to 1927(after which Miyagi gave his demonstration). The story goes that Miyagi had attended a two hour lecture demonstration of judo in Okinawa performed by none other than Jigoro Kano, judo’s founder and his student. Miyagi was impressed, but also said afterwards that any worthy martial artist could perform for hours with similar endurance. The newspaper, Asahi Shimbun, upon hearing these comments asked Miyagi to give a similar demonstration, but one featuring karate. It was reported that the demonstration was astounding and it lasted all afternoon. (19) This story was given to this author by Sean Wong who teaches Meibukan in Markhan, Ontario (north of Toronto, Cananda). 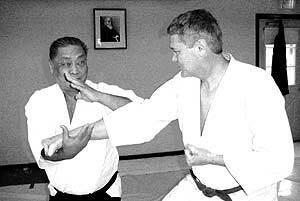 (20) Discussion with Glenn Cunningham of the NYC Jundokan (Miyazato’s Goju Karate Organization based in Naha, Okinawa). See the article by Cunningham, “How A Technique From Tensho Kata Saved My Life On The Street” in FightingArts.com Reading Room under “Kata and Applications.” When I was at the Judokan, Masaji Taira was one of my favorite teachers because he was very application minded and willing to share his knowledge. He is a Naha policeman by trade. After practice Taira sensei and others would often go drinking and after loosening up would start karate discussions. This often led to tables being pulled to the side and my body bent and hit in demonstration of various kata techniques. Taira also had the hardest hitting jun-zuki (side thrust punch usually done in a horse stance) I have ever felt. His power was developed not using muscle power, but coordinating snap and the drop of weight into the technique. (22) This book, “Goju Ryu Karate Do Kyohan” by Gogen “The Cat” Yamaguchi is available in FightingArts.com’s E-Store, under “Collector’s Series” in the Category of Books.